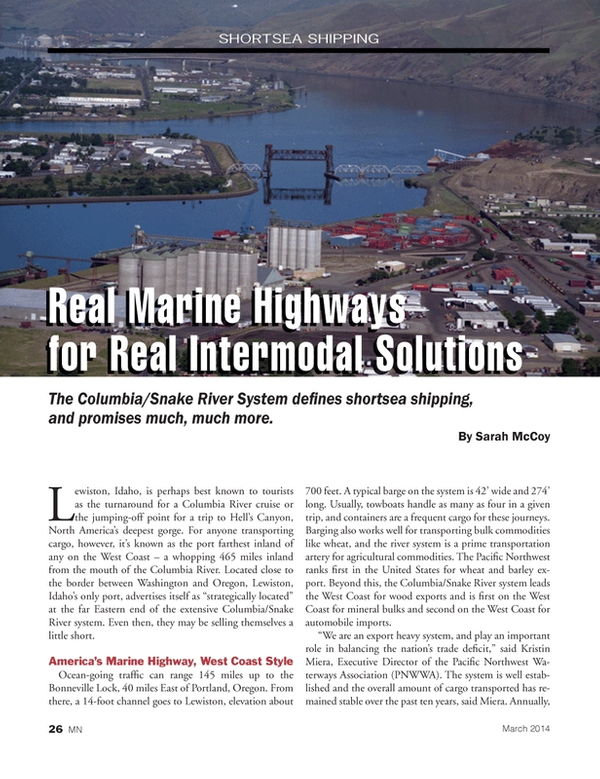 The Columbia/Snake River System defines shortsea shipping, and promises much, much more. Lewiston, Idaho, is perhaps best known to tourists as the turnaround for a Columbia River cruise or the jumping-off point for a trip to Hell’s Canyon, North America’s deepest gorge. For anyone transporting cargo, however, it’s known as the port farthest inland of any on the West Coast – a whopping 465 miles inland from the mouth of the Columbia River. Located close to the border between Washington and Oregon, Lewiston, Idaho’s only port, advertises itself as “strategically located” at the far Eastern end of the extensive Columbia/Snake River system. Even then, they may be selling themselves a little short. Ocean-going traffic can range 145 miles up to the Bonneville Lock, 40 miles East of Portland, Oregon. From there, a 14-foot channel goes to Lewiston, elevation about 700 feet. A typical barge on the system is 42’ wide and 274’ long. Usually, towboats handle as many as four in a given trip, and containers are a frequent cargo for these journeys. Barging also works well for transporting bulk commodities like wheat, and the river system is a prime transportation artery for agricultural commodities. The Pacific Northwest ranks first in the United States for wheat and barley export. Beyond this, the Columbia/Snake River system leads the West Coast for wood exports and is first on the West Coast for mineral bulks and second on the West Coast for automobile imports. “We are an export heavy system, and play an important role in balancing the nation’s trade deficit,” said Kristin Miera, Executive Director of the Pacific Northwest Waterways Association (PNWWA). The system is well established and the overall amount of cargo transported has remained stable over the past ten years, said Miera. Annually, PNWWA says that ten million tons of commercial cargo valued at three billion dollars passes annually over this inland waterway. The Port of Portland, through which almost all cargo goes, reported a container total for 2013 as 178,451 TEU (twenty-foot equivalent units), Miera said. Half of all wheat exports arrive by barge. Twenty-five grain elevators in this large farming region with its highly developed river keep barge transportation very competitive. In turn, low costs allow growers to price commodities at levels comfortable for export markets. In 2012, EGT, a state-of-the art grain export facility was opened in Longview, Washington, not far from the mouth of the Columbia. EGT’s facility is the first export grain terminal built in the U.S. in 25 years. “We move a lot of bulk grain shipments out of here. Bulk wheat shipments are the main commodities shipped on the Columbia/Snake River system. These grain shipments are what allow containers on barges to be cost effective. Because you’re moving these grain barges up and down river all the time, it’s then cost effective to just tie in a container barge into that tow,” he said. In the past, the Port of Lewiston had space for only one barge at a time at its dock, but after recent improvements, two barges fit comfortably. Now, said Doeringsfeld, “We’ll be able to load one while we’re unloading another. It also opens up some ‘break bulk’ opportunities. Lewiston’s dock is 250-feet long and capable of handling any roll-on/roll off cargo allowed on area highways. Even before the expanded dock, the Port of Lewiston was working with U.S. and Canadian companies and logistics firms to handle oversized cargo bound inland. For example, refinery equipment has gone to the Kearl Oil Sands in Alberta, Canada. Wind generators have made their way to the U.S. Midwest and parts for coal-fired electrical generation plants into Wyoming. Significantly, Lewiston lies less than 800 miles by road from the Sidney, Montana and Williston, North Dakota area and may be a less-expensive alternative route to the oil fields. In the past, shipments of pipe manufactured in Asia have gone through the Panama Canal and then up through Houston to oil producing areas. Lewiston and the Eastern Oregon ports of Umatilla and Morrow are looking for more oversize loads. Lewiston is versatile, as well. The long dock at the Port of Lewiston has also been used to send shipments downriver. An Idaho company manufactured a load of 39 modular dorms and put them onto a 400-foot-long, 76-foot wide ocean going barge twice as big as most of the barges that call on Lewiston. The barge took the dormitory parts all the way to Seward, Alaska without stopping to switch to a bigger boat. They became a three-story dormitory for Alaska Vocational Technical College in Seward. Nevertheless, there have been political objections to moving the giant loads on a highway close to Lewiston, Highway 12, which parallels a Wild-and-Scenic-designated river. However, there is more than one route. Doeringsfeld said he is optimistic about future shipments. Kim B. Puzey, General Manager of the Port of Umatilla and current president of the PNWWA, said that his port has just replaced a crane built in 1940 and would also be interested in the oversized loads. Separately, John McCalla, president & CEO, Omega Morgan, specialists in large-scale moving operations, said, “The ports along the Columbia and Snake River continue to offer Omega Morgan opportunities to ship right sized cargo into the Midwest and Canada. The outlook for 2014 and beyond remains strong for continuing use of the routes leading from those ports.” That’s the quintessential definition of shortsea shipping: alive and well on America’s West Coast.